Federal Finance Minister Dr. Abdul Hafeez Shaikh denied any proposal about salaries of government employees. During Question Answer Session in National Assembly on 10 December 2012, he told that currently there is no proposal of increase in salaries is under consideration. He further added that federal government of Pakistan has already increased salaries up to 120% during last five years. There are many rumours of increase in salaries, unified pay scales and revised pay scales are in the news since last several months. But now after the statement of Federal Finance Minister, it seems that there are no chances of salary increase of government employees in near future. 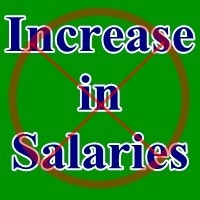 We have also published posts about "salaries increase" on this blog in past after receiving news from electronic and print media so we feel that it is our duty to keep our readers update about current scenario. We will publish more news on this blog when we will come to know about any update.